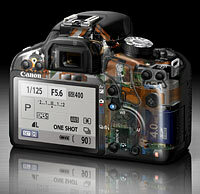 Just posted: our hands-on preview of the Canon EOS 500D / T1i. We've managed to get our hands on Canon's latest consumer-grade DSLR and have been delving through the menus and scrutinizing its new features. We've also gone out and shot a handful of real-world sample images to show what it's capable of. So come in and meet the new Rebel.